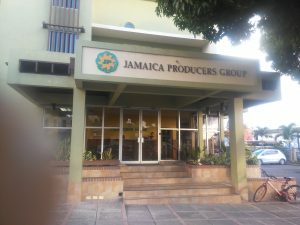 An announcement is set for today, that the Wisynco Group has picked up the distribution of certain Jamaica Producers’ products. A check with a spokesperson for Wisynco indicated that they could not confirm the distribution agreement. 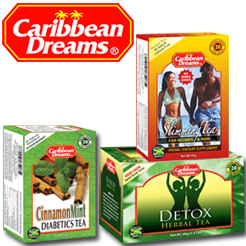 It is unclear whether the new distribution agreement is only for the Jamaican market or if it includes other markets as well. 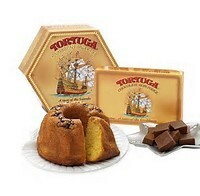 Other sources had indicated the distribution was for Tortuga Rum Cake Jeffery Hall, Managing Director of Jamaica Producers 62 percent shareholders in Tortuga International Holdings manufacturers of the rum cake, told IC Insider.com that the distribution of Rum cake remains with Select Brands who have indebt knwoledge of the market for the Rum Cake. Tortuga International had revenues of $879 million in 2018 according to the group’s audited accounts. The link up with Wisynco would be expected to drive growth for the product that suffered a slight fall in revenues in 2018 compared to 29017. 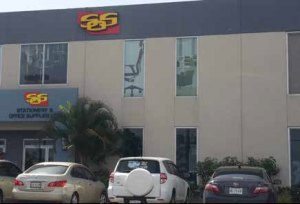 Wisynco confirmed that the company are now distributors of packaged sugar for the Pan Caribbean sugar company in Frome as well as Appleton Sugar factory. Seprod is also said to be co distributors as well for the pacaked Appleton sugar. The latest set of listed companies to report financials show an array of impressive profits for a number of them, turn around situation in one and flat results for a few. C&W reported a small loss of $138M for 2017 before tax. Cable and Wireless reported a very small loss for 2017 down sharply from a billion loss in 2016 and is about to break out into a highly profitable period starting in 2018. The company that has chalked up accumulated losses of more than $48 billion reported losses of only $138 million before tax for 2017, and just $383 million after tax, flowing from a 9 percent rise in revenues to $27 billion with a big rise in mobile revenues by 54 percent to $15 billion while interest cost at $5.2 billion the company lost the year, down from a loss of $1.4 billion in 2016. With the sharp fall in interest rates locally interest cost should drop by around $2 billion in 2018 and plunge the company into an excellent profit position with continued growth in revenues. Unfortunately, the parent company wants to take over the company at a low price, after local shareholders have suffered losses for many years at just the stage when good times seem to be returning. 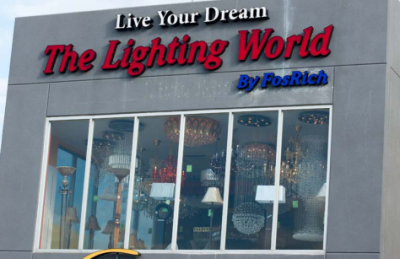 Newly listed FosRich Group posted an 81 percent increase in profit to $55 million and earnings per share of 14 cents from revenues that fell 9.5 percent to $1.05 billion, but helped by other income of $42 million comprising mostly interest and foreign exchange gains. Jamaica Producers enjoyed strong gains in operating profits with an increase of 77 percent to $662 million after adjusting the 2016 results for non-recurring gains of $3.7 billion. 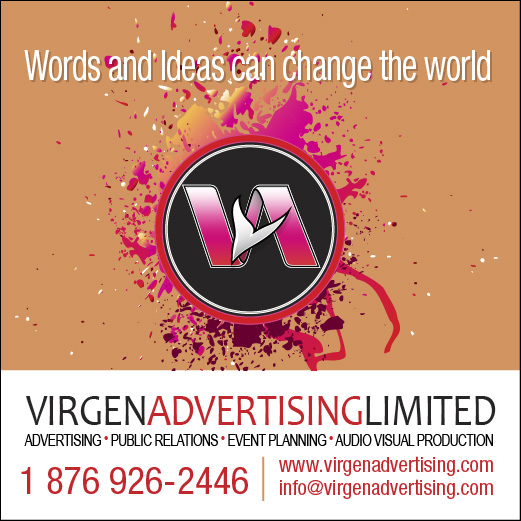 Operating income for the year was up an impressive 34 percent resulting in gross profit rising from $3.24 billion to $5.14 billion. Earnings per share came in at 59 cents. Stationery and Office Supplies that listed in August last year enjoyed a 29 percent bounce in revenues for the full year and 37 percent rise in the December quarter to record full year revenues of $906 million and a 78 percent rise in profits to $83 or earnings per share of 38 cents. Kingston Wharves profit climbed 18 percent from $1.29 billion to $1.63 billion for 2018 from revenues that moved from $5.41 billion to $6.37 billion for a rise of 28 percent and ended with earnings per share of $1.14. Grace Kennedy continues to struggle to increase profits ended 2018 with flat results of $4.15 billion versus $4.12 billion in 2016. The 2016 figures and one off gains that makes the 2018 better that it appears on the surface. Revenues rose from $88.3 billion to $92 billion in 2018 and other revenues slipped from $2.38 billion to $2.1 billion. The group reports $4.15 in earnings per share. FosRich profit rose 77% for 2017. Supreme Ventures reports earnings per share at $44 cents from profits that are virtually flat with 2016 results coming from a 25 percent rise in revenues to $56.2 billion. Profit for the year ended at $1.197 billion from $1.178 billion. The 29017 suffered from write off of assets and impairment amounting to $484 million while repairs and maintenance rose by $110 million. The 2017 listed Victoria Mutual Investments reports a 9 percent rise in profits to $346 million from a 19 percent rise in net income of $966 million and produced earnings per share of 29 cents. Elite Diagnostics could be in the Junior Market TOP 10 by the end of 2018. 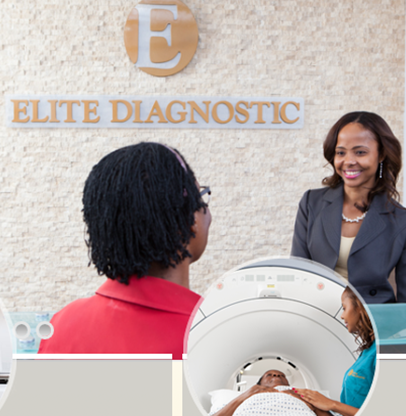 Word reaching IC Insider.com from usually reliable sources, is that the much delayed Initial Public Offer for Elite Diagnostics was oversubscribed before the revised prospectus was posted on the Jamaica Stock Exchange on Monday. The company is issuing just over 70 million shares at a price of $2 each and a PE ratio around 9 times estimated 2018 earnings and just under 6 times 2019 estimated earnings. The shares were to have officially opened on Monday January 22, but was put off until Wednesday 24, following amendment to include depreciation that was omitted from interim results to September, and then was pulled to correct errors in the interim results balance sheet and cash flow statement. The issue will now officially open on Monday February 5 and is expected to list on the Junior Market of the stock exchange that will see profit being tax free for 5 years and at half the regular rate for the second 5 years. 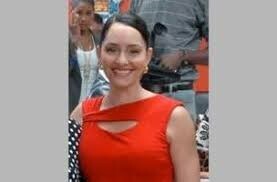 Brokers for the issue are NCB Capital Markets and Sagicor Investments. Trading activity on the main market ended on Monday as 25 securities changed hands, leading to 3,323,821 shares valued at $32,670,539 changing hands, with the prices of 7 stocks rising, 11 declining and 7 trading firm. 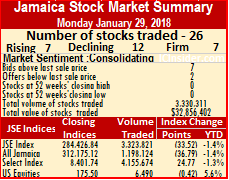 At the close of the market the JSE All Jamaican Composite Index dipped 36.79 points to 312,175.12 and the JSE Index lost 33.52 points to 284,426.84. In main market activity, Barita Investments ended at $8, with 1,774 stock units, Cable & Wireless concluded trading at $1.35, with 22,165 units, Carreras finished with a loss of 1 cent at $11.29, with 47,138 shares, Caribbean Cement settled with a loss of 10 cents at $32.50, with 4,300 shares, Ciboney Group ended trading at 22 cents, with 800 shares. Grace Kennedy traded with a loss of 60 cents at $42.50, with 15,000 stock units, Jamaica Broilers finished trading 50 cents higher at $18.50, with 15,969 units, Jamaica Producers closed with a loss of $1 for the second day in a row, to close at $15, with 3,000 shares, Jamaica Stock Exchange ended with a loss of 35 cents at $6.65, with 8,489 shares. JMMB Group concluded trading with a loss of $1 at $24, with 12,937 shares, Kingston Wharves settled with a loss of 50 cents at $33, with 2,685 units, Mayberry Investments ended trading 10 cents higher at $5.85, with 419,093 shares, NCB Financial Group traded 85 cents higher at $100.85, with 88,617 shares. 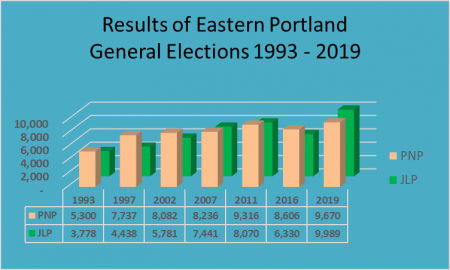 1834 Investments finished trading at $1.20, with 11,700 shares, PanJam Investment ended 50 cents higher at $40.50, with 2,405 units, Portland JSX concluded trading at $11, with 814 shares, Pulse Investments finished 5 cents higher at $2, with 214,000 shares. Radio Jamaica settled with a loss of 5 cents at $1.05, with 18,744 shares, Sagicor Group ended trading at $35.20, with 7,022 stock units, Sagicor Real Estate Fund ended trading with a loss of 20 cents at $14, with 42,280 shares. Salada Foods traded 5 cents higher at $12.55, with 100 units, Scotia Group finished trading with a loss of 95 cents at $50.05, with 4,487 shares. Supreme Ventures concluded trading at $11.50, with 254,605 stock units, Victoria Mutual Investments finished with a loss of 11 cents at $4.01, with 1,225,416 units and Wisynco Group settled 25 cents higher at $10.45, with 900,281 shares. 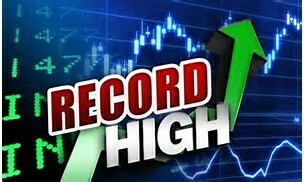 The main market of the Jamaica Stock Exchange surged to a new high at 12.30 pm on Friday with the all Jamaica Composite index jumping 8,505.30 points to a record 289,062.69 while the main market index rose 7,749.29 points to a record 263,368.84. The Combined Index jumped 7,344.21 points to a record 276,121.30 as market sentiments suggest that the market may be at an early stage of a major bull run. The junior market that slipped 1.95 points at 11am is now up 18.94 to 3,117.84 while the US dollar market index that was unchnaged at 182.58 in the morning session is now up4.60 to 187.18. 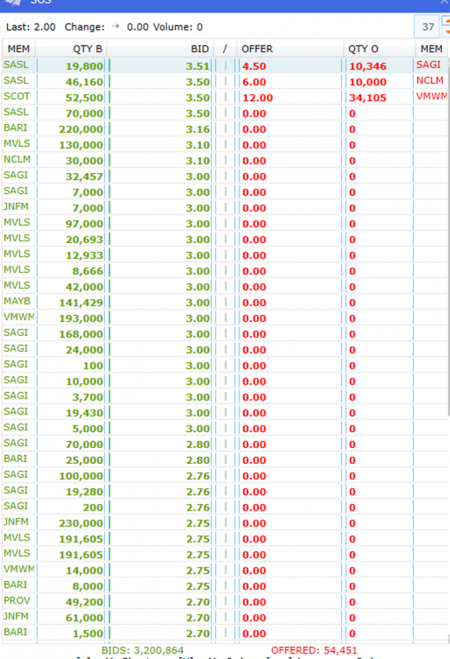 Scotia Group is a mjor contributor to the big market gain with the privce jumping to $52 and only 389 units are now offered at $52. Supreme Ventures traded at a new high of $12.90 but sits at $12.50 with half an hour of trading to go. Jamaica Producers at $14.50, currently. 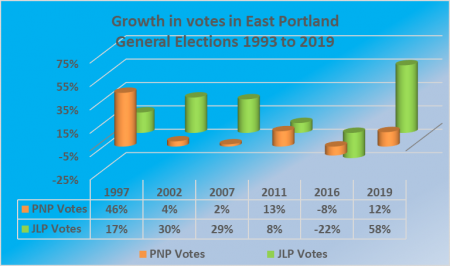 Jamaica Producers made huge improvement in its operations, with strong gains in operating profit, helped by consolidation of Kingston Wharves but more importantly major gains from its other core business. The company reported profit attributable to shareholders of $158 million for the second quarter to June and $251 million for the half year to June, 2017. The results flowed from revenues of $7.4 billion up from $4.6 billion in 2016 for the half year and $4 billion for the quarter, up from $2.4 billion in 2016. In 2016 the group’s share of Kingston Wharves was treated as an associate as such the revenues for 2016 does not include that for wharf as is the case in 2017. The results translate to 14 cents per share for the quarter and 22 cents for the half year and should end around 50 cents for the year. With a stock price of $14.50 the market value is a very rich 29 times earnings. J amaica’s telecom provider, Cable & Wireless, is reporting profit from operation in the June quarter this year, compared to a loss in the same period in 2016. The company enjoyed an 11 percent rise in revenues helped mainly by a 22 percent increase in mobile revenues to generate $6.8 billion in revenues up from $6 billion in 2016 and profit of $222 million versus a loss of $695 million in the June quarter of 2016. Operating cost fell to $4.24 billion from $4.5 billion in the 2016 quarter to generate profit before finance cost of $1.59 billion. For the six months, revenue of $13.2 billion was generated with a loss of $311 million compared to a profit of $1.1 billion in 2016 from revenues of $11.85 billion. Subsequent to the quarter the company announced a series of price increases that is set to boost revenues and help the bottom-line. 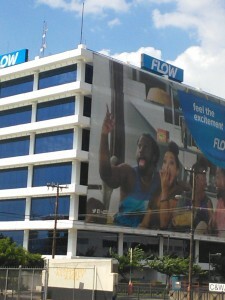 the stock closed on Friday on the Jamaica Stock Exchange at $1.07. The latest information makes this stock one to watch next week. Carreras as high as $110 after stock split announcement. The directors of Carreras advised that they will be recommending a 10 for 1 stock split to members of the Company at its Annual General Meeting scheduled for September 6. In order to facilitate the proposed subdivision of the existing ordinary shares in the capital of the Company, the maximum number of shares that the Company is authorized to issue is to be increased by a subdivision into 10 ordinary shares for each one that currently exists and thus raising the authorized capital to $4.8544 billion units with effect from the close of business on September 20, 2017. 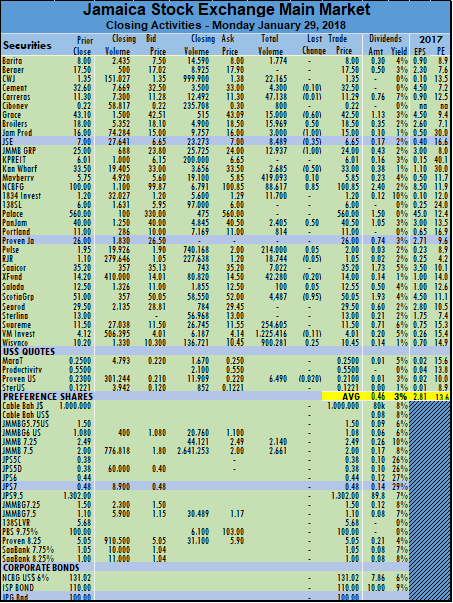 The existing issued shares are to be increased from 485,440,000 units of no par value to 4,854,400,000 ordinary shares of no par value. The ex-stock split date is September 18, 2017. Carreras stock trades at $110 on the main market of the Jamaica Stock Exchange. Stationery & Office Supplies was listed on the Junior Market of the Jamaica Stock Exchange on Thursday. The stock was offered to the public in mid-July at $2 each and was heavily oversubscribed, has bids to buy 98,660 units as high as $3.50 and 19,800 shares at $3.51. No trade has taken place with 10,346 units being offered at $4.50, 10,000 units at $6 and 34,105 shares at $12 in the morning session. 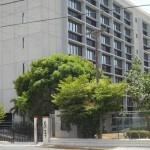 Currently bids amount to buy more than 3.2 million units down to $2.50 up to $3.51. 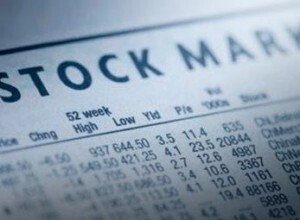 The stock exchange circuit breaker rule would restrict the maximum price the shares can trade at today at $2.60, and if it does not trade by the close, the maximum it can trade at on Friday would be $2.90. With bids at $3.50 and above currently, then it may not trade on Friday either if investors starts bids above $2.90 on Friday. Unless management intervene as they did for Express Catering it likely to be well into next week before the first trades would start.